Our Brunswick surgery was one of the first accredited practices in the country. It brings our prestigious flagship hospital standard even closer to you. 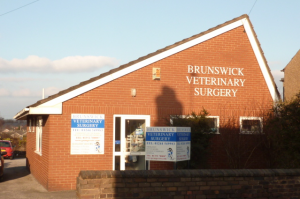 If you live in Buckley or the surrounding area, visit our Brunswick Veterinary Surgery today and let our experienced team surround your pet with all the devoted, loving attention they could ever possibly ask for. Our practice in Buckley was the very first branch surgery of the Grange Veterinary Hospital in Mold. It was purposefully built in 1982 to manage the increasing number of pets we were treating at our flagship hospital – mainly because of our growing popularity in the area. Today the practice treats over one thousand active clients, who are all located in the surrounding community. This number is always increasing, and we love to meet new pets – and their owners – on a daily basis. So if you’re thinking of joining this practice, simply give our team a ring or pop into the surgery; you’re always more than welcome to come and say hello. Our surgery is equipped to offer all the treatment your pet could ever possibly require. So whether it’s time for your pet’s booster vaccination, or you simply need some advice about something that has been concerning you, a short trip to our surgery could dramatically improve your pet’s health and help put your mind at ease. We can even carry out laser treatments here, which can be incredibly useful to help your pet recover from various illnesses and medical conditions. However, if your pet requires any surgical procedures or a special diagnosis, we will simply invite you to the Grange Veterinary Hospital.